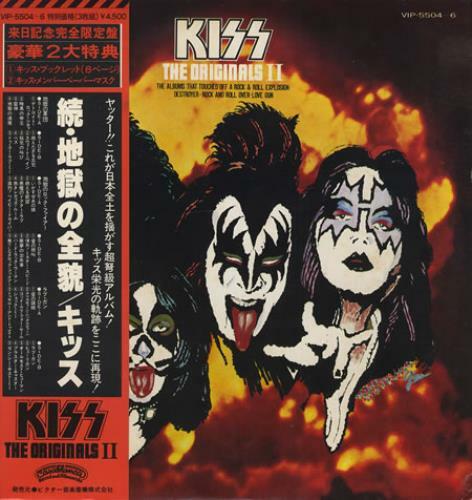 KISS The Originals II (Super Rare 1978 Japanese-only 29-track triple LP, repackaging the albums Destroyer, Rock & Roll Over & Love Gun in a unique gatefold picture sleeve complete with artwork inners, an eight-page lyric booklet, a glossyfull colour eight-page photo booklet, four superb Kiss masks & the original wide obi-strip. The packaging is Excellent with some minor ring wear & light foxing inside, the masks are unused. 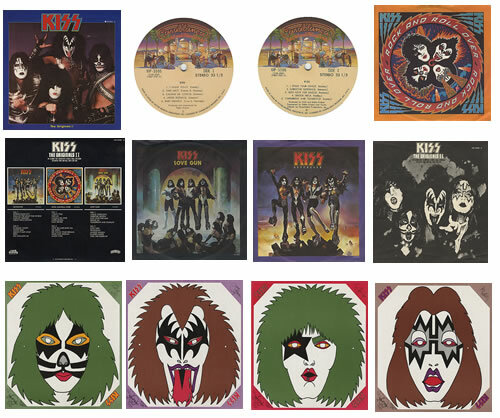 All three vinyl discs have a brown tint when held to the light & appear unplayed. Very tough find in this complete state! VIP-5504~6).